The Arts Integration Framework is intended to help teaching artists of any arts discipline design and conduct high quality professional development experience in arts integration for classroom teachers. This Framework is written by teaching artists for teaching artists. We, the writers, developed the Framework to inspire you, the teaching artist, as you design and implement your PD experiences for classroom teachers. Our goal is simple: your success. We hope that you will find golden nuggets of information and suggestions that will help you move your interactions with classroom teachers to greater levels of effectiveness. We want you to find validation for choices you already make and new insights that encourage you to take risks and discover well-documented ways to inspire and educate your classroom teacher participants. The topics covered in this Framework help increase the effectiveness of arts integration PD experiences. More importantly, such PD experiences increase the likelihood that classroom teachers will transfer and embed the new integration skills and knowledge into their classroom practice. As Joyce & Showers (2002) found, simply telling or showing classroom teachers how to teach has almost no effect on their teaching and doesn’t transfer into actual practice in the classroom. Teachers may understand and/or appreciate what arts integration can do, but they cannot effectively facilitate such an approach themselves. We trust that you will take the ideas included here and make them your own. The Framework is not a step-by-step method, rather a collection of ideas to mull over as you work with classroom teachers. We refers to the Framework writers. You refers to the reader (yes, you). Teaching artist refers to any artist who conducts workshops for classroom teachers. Classroom teacher refers to individuals who teach in formal classroom settings and who are the recipients of the workshops described in the Framework. Professional Development Experience (often PD experience) refers to any workshop, course, institute or other training. Arts learning experience refers to any arts-integrated lesson or session. How might you approach the Framework? Read all of it. Read some of it. Read what you need. Read what you hope to learn. Ready to explore the Arts Integration Framework? 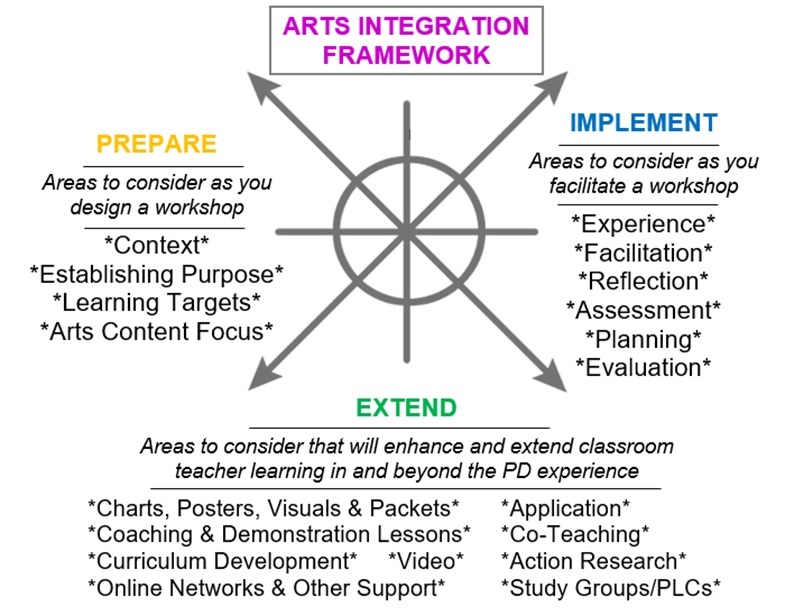 First, you’ll probably want to explore the many Components that are the core of the Arts Integration Framework (see chart at right) . The Components are key concepts, activities and experiences that contribute to quality professional development workshops in arts integration. If you are designing a new workshop, go to the Workshop Design Considerations to find suggestions for how to include the Components in PD experiences of various sizes. * Search for a workshop length similar to what you want to offer. * Read about which Components might best serve your developing workshop. * Follow the links to the relevant Components and explore how to best use each. Have a workshop you would like to enhance? If you already have a workshop, jump directly to the Component Checklist, for questions that might help you fine-tune or revise your workshop. Wish to see examples in action? Go to the Video Resources page. More often than not, resources are embedded within the text and are just a click away. But there is more valuable material on the Resources page: practical handouts and examples, links, articles and other resources that can help enrich the PD experience. We consider the Arts Integration website a work in progress. We hope that you will share your successes and experiences with peers through this Framework. We also welcome and encourage feedback on how to improve its usefulness. Contact Us.